Environmental archaeology provides a landscape context for the archaeological activities on sites. This may be reconstructing how whole regions looked in the past — what today is open grassland may once have been covered by a forest, or the sea; or unravelling the activities of the people who lived there in past centuries, what they grew, what they ate, even what they did for a living. I got into environmental archaeology when, as a geography undergraduate, I was introduced to the world of pollen through the Bronze Age copper mine site of Mount Gabriel, Co. Cork. After graduating, I went on to take a Masters, investigating the presence of early Mesolithic people in the area – and I believe we found them, too! This work sparked my interest in palaeoenvironmental techniques and how they can be applied to archaeological sites. Finding evidence of early Mesolithic people in the environmental record showed how these techniques can provide evidence of humans in the landscape from periods where we have no visible archaeology. 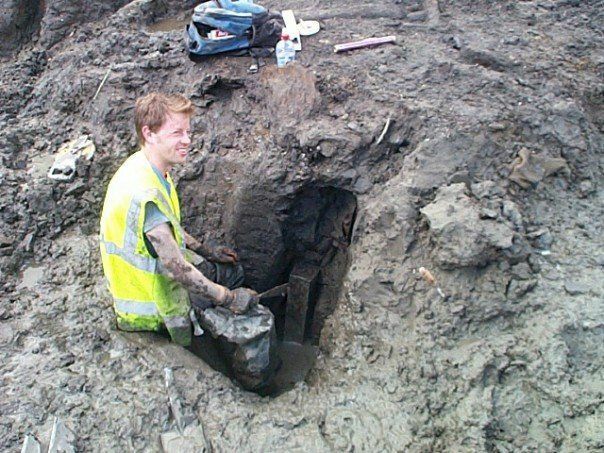 After completing my PhD in the Archaeology Department of the University of Reading (where I investigated submerged forests along the Severn Estuary and Bristol Channel) I joined Headland Archaeology Ltd., starting at Project Officer Level. I was responsible for the processing, assessment and analysis of environmental samples from sites in Scotland. With environmental archaeology becoming ever more important, I soon found this role expanding and my responsibilities broadening. Today, I head a team of specialists carrying out environmental work, covering a wide range of site types and periods. I regularly find myself working on pollen from a Neolithic site in Co. Wexford one day, and plant macrofossils from a Medieval midden in the heart of Edinburgh’s old town the next. The scale can also differ greatly, from whole road schemes with multiple sites that allow a broad overview of the landscape, to the specifics of an individual site. I am continually developing my own skills and recently have become involved in setting up environmental sampling strategies. But I like to go out into the field as much as I can: it is a great opportunity for lively discussions with the field archaeologists (never mention ‘ritual’ to an environmental archaeologist! ), that, in turn, can lead to new theories and new strategies being formed and, best of all, figuring out how to answer these hypotheses. It is heartening to see more and more people taking an interest environmental archaeology: the discipline has a solid career progression, and with more commercial units having their own post-excavation departments, environmental archaeology is becoming a business in its own right. I certainly see environmental archaeology growing as a profession, becoming ever more important to archaeological investigations.